Nobody likes sifting through old emails and call notes, or chasing law firms for budget information. And, most would agree that manually tracking budgets and requests for them using a spreadsheet isn’t the best use of time. 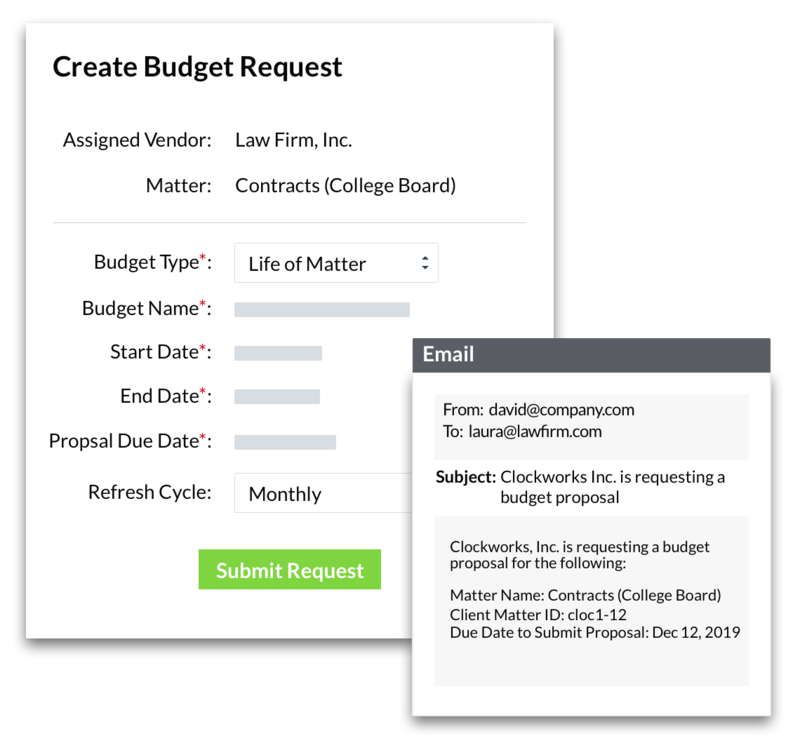 SimpleLegal’s latest feature – Budget Request – fundamentally changes the process of requesting, collecting, reviewing, and approving matter-level budgets from vendors. In-house counsel opens a matter, assigns a vendor, then sends a request for a budget from within SimpleLegal. Vendor reviews the matter details and submits a budget proposal, including what the assumptions, scope, and risk factors are from CounselGO, our vendor portal. In-house counsel reviews the budget and approves or rejects it. If rejected, they can send the budget back to the vendor, identifying why it was rejected, and have the vendor submit a new proposal. Once the budget is approved, it becomes active in the SimpleLegal system. In-house counsel can set a schedule for the vendor to revisit the budget and submit any updates to it (refreshing the budget). Budget Request is a more streamlined and structured way to manage budgets and shifts the responsibility of collecting and managing budgets to your vendors so your team can focus on higher-priority legal work. Leveraging automated request and reminder emails – no manual work involved! Sending notifications to those involved on the budget when changes are made. Requesting updates to budgets on-demand or on a schedule you set. Eliminating the need to manually enter budget information into SimpleLegal once approved. Everything happens in one central system, and all approved budgets are tracked in real-time and interact with accruals, ensuring you have the most accurate and up-to-date budget information. You can even enforce your budget process, restricting vendors from being able to submit invoices on matters without an active budget! Get more information on Budget Request or schedule a free demo to see it in action!